The health of at least 7 million inhabitants in Moldavia and Ukraine is seriously threatened by a stock of old pesticides. This has been reported by the International HCH and Pesticides Association (IHPA). According to the organization the EU must act as fast as possible to disarm this ‘biggest chemical time bomb of Europe’. This was incited at the closure of the 10th HCH & Pesticides Forum of the IHPA in the Czech Republic. During the congress it became known that in the former Kalush factory in the west of Ukraine there is a stock of no less than 10,000 tonnes of superfluous Hexachlorobenzene (HCB). It’s particularly the positioning along the Dniester river that makes the situation extremely hazardous: a single flood and the high concentrations of poison would pollute the natural habitat of some 7 million people in the west of Ukraine and Moldavia. In total, tens of millions of inhabitants in Europe, Central Asia and the former Soviet Union are being threatened by pesticides. In Ukraine alone there are 4,500 storage locations with more than 30,000 tonnes of old pesticides, a legacy from the Soviet era. The substances have been prohibited since 2001. As a rule the packaging only lasts five to ten years. If nothing happens in that time, then the substances could simply end up in the soil or in the water. It’s especially the rural population which is in danger, the IHPA reports. The WHO has estimated that in 2050 every second human being will die from cancer due to the contamination in food, water and the environment. A major portion will be caused by pesticides. There’s also the threat of major financial losses. The relatively minor Nitrofen scandal (2002) in the former East Germany alone, cost a total of 500 million euro. The IHPA estimates that the stabilization or destruction of all current stocks of superfluous pesticides amounts to 1 billion euro. In the final statement, the IHPA calls on the European Commission to make haste in developing a solid plan of action, in close cooperation with the EU member states, the non-EU countries covered by the European Neighbourhood Policy and the relevant countries in Central Asia. 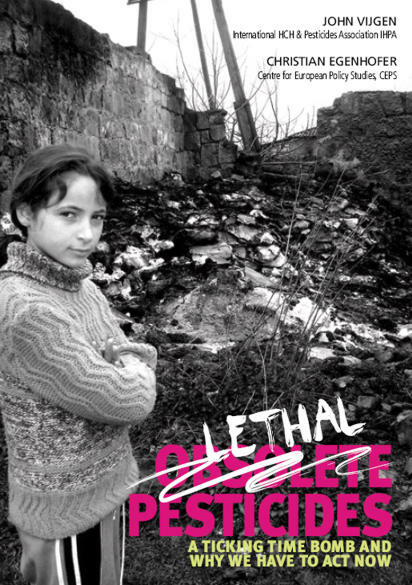 IHPA has in joint cooperation with CEPS, Centre for European Policy Studies published the book: Obsolete (lethal) Pesticides, a ticking time bomb and why we have to act now, in August 2009. The book is extensively discussed at the 10th Int. HCH and Pesticides Forum in Brno, 7-10 September 2009, and contains the IHPA strategy on how to eradicate Obsolete and POPs pesticides in the next decade. Further is IHPA active in the European Parliament. A special Working Group on Obsolete Pesticides has been established. An overview of activities can be seen on European Parliament page. IHPA works together with partners on a lot of projects. Former and present projects are briefly described on Projects page.